Is The Punisher’s critique of toxic masculinity compelling or hypocritical? One of the tricky things about binge-reviewing a heavily serialized show like The Punisher is that I feel like I’m constantly trying to review both each individual episode and the season as a whole. But, of course, it can be hard to weigh in on a whole season before you’ve actually seen it all. So while I stand by my episode-specific critiques of “Flustercluck,” I may have been a little preemptive in my critiques of the season. Because for as frustrating as I found Billy’s arc in that previous episode, I’m back to finding him pretty compelling again in this one. On the other hand, given that this is basically just the brutal version of Billy from the end of season two, perhaps this season didn’t need to spend quite so much time “rebuilding the jigsaw” of his villainy. Especially when it doesn’t look like the show plans to actually interrogate his feelings about learning that he participated in murdering the Castles—which, again, is the most compelling reason to do an amnesia storyline in the first place. If you can’t tell from that rambling opening, “The Dark Hearts Of Men” is an episode I feel a whole bunch of different ways about. And since I’m so conflicted, I’d actually like to discuss this episode through two different lenses. The first is as a piece of art, devoid from any real world connections. On that level, I think “The Dark Hearts Of Men” is a solid success. It’s a simple but riveting episode that digs into some of the grimmest material the show has ever tackled. There’s a thematic cohesion to the episode’s exploration of masculinity, and a strong sense of momentum as it builds to Frank’s assault on the Valhalla warehouse. 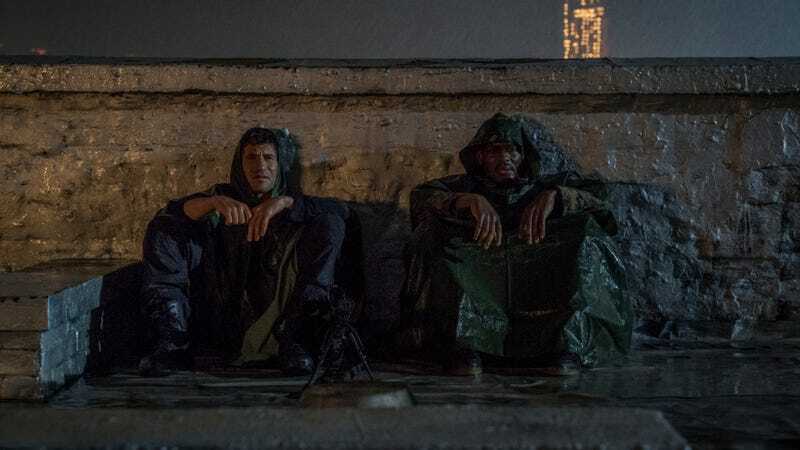 The rained-soaked sequences provide a sense of portent, which is matched in some truly shocking twists and turns. At its best, “The Dark Hearts Of Men” is a fascinating exploration of masculinity—particularly the razor thin line between the masculinity our culture considers “good” (the violent brotherhood of the Marines, as seen in the episode’s opening prologue) and masculinity our culture considers “bad” (the violent brotherhood of an illegal gang). That those two versions of masculinity can look and feel so similar is the root of an awful lot of societal problems. Frank, Billy, and John Pilgrim represent three sides of the same hyper-violent masculine coin, with Curtis offering a different example of masculinity, and Madani and Dumont trying to break it all down from their outsiders’ perspective. As is usually the case on The Punisher, that involves a lot of blunt speechifying about morality intercut with moments of intense violence. Other than the weak thread about John Pilgrim descending back into a life of hedonistic violence, there’s strong stuff throughout: The always great Curtis/Frank friendship dynamic during their stakeout; an intriguing new relationship between Madani and Dr. Dumont; and a great scene where Billy manipulates his men into joining his fight against Frank by exploiting their loyalty and desire for brotherhood. The other lens through which I’d like to view this episode is as a piece of social commentary, which it’s very much trying to be. As I mentioned, this is an episode all about masculinity and the many toxic ways it can manifest and/or be manipulated. Yet, on a most basic level, I’m not sure The Punisher is a show that’s capable of critiquing toxic masculinity. Because it’s also a show that’s first and foremost about glorifying it. No matter how many times The Punisher wants to debate Frank’s morality, at the end of the day we’re always going to be on his side. When he accidentally murders a group of women, we’re not sad for them (we don’t know anything about them, they’re just dead body props), we’re sad for Frank because he was tricked into murdering innocent people. This show is always going to love Frank way too much to actually condemn him in any kind of meaningful way, which is also how it treats its action scenes. Even when they’re horrific, we’re supposed to find the show’s bloody action sequences at least a little bit thrilling too. And that’s exactly how I found this episode’s climatic showdown. Horrific, compelling, and, yes, really cool to watch. But the problem is, you can’t criticize the violence of toxic masculinity when you’re also trying to celebrate it. The Punisher’s critique of masculinity is like a beauty pageant rebranding itself as a form of female empowerment or a makeup company selling its products as feminist self-care. Is that better than the alternative where we don’t discuss female empowerment or toxic masculinity at all? Probably. Does it still feel hollow and manipulative? Yes. Does The Punisher’s hollow social critique have an impact on its artistic merit? That’s where I’m not so sure. Again, I really did enjoy watching “The Dark Hearts Of Men,” and I found the moment where Frank discovers the murdered women to be incredibly devastating, especially his desperate repetition of “wait, wait,” which so perfectly captures the disbelief of having made a horrible, irreversible mistake. It’s entertaining art, for sure. I’m just not sure it’s particularly meaningful art. The payoff of Dr. Dumont providing Billy with a psychological plan to take down Frank is compelling, but this episode’s dual timeline structure never quite works, especially because it opens with a Marine flashback that only makes things more confusing. Speaking of flashbacks, I wish this show would use more of them! Actually seeing Frank and Billy’s friendship drives home Billy’s betrayal way more palpably than a million angsty monologues ever could. It wasn’t until this episode that I realized this season could be subtitled The Punisher: Kill Bill. I get that it’s the basic premise of the show, but, like, how is Frank so much better at fighting than everyone else? 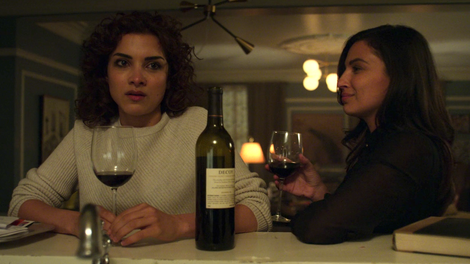 The Madani/Dumont scenes in this episode are a really great example of how the Bechdel Test can be used not as a quality judgment, but simply as an analytical tool. I really liked the scenes and it’s always refreshing to see female characters actually get to talk to each other in a genre property (which happens way less than you might think, even in female-led projects like Wonder Woman or the new Star Wars trilogy). Yet this is also a show where the female characters spend all their time talking about men. That’s not inherently bad, but it’s worth pointing out how frequently it happens, which is what the Bechdel Test does!